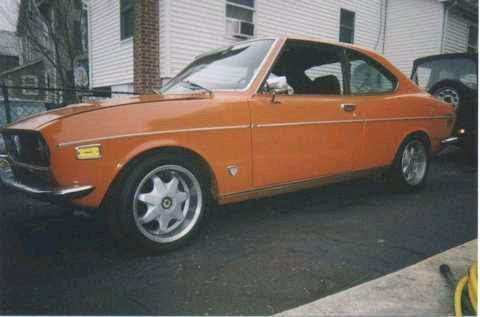 I'm looking to get some new wheels for my rx2. I want some 15x6 or 15x7. 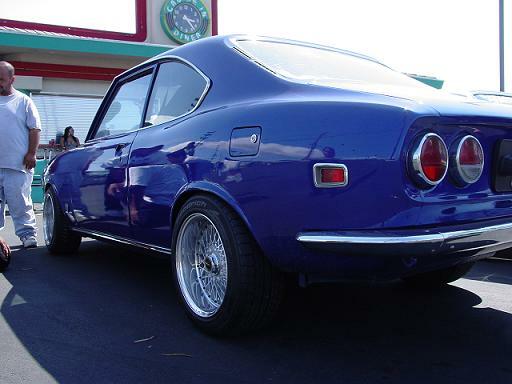 What is the correct wheel offset for this car so that the wheels and tires are not sticking out of the fender wells- I hate that look. 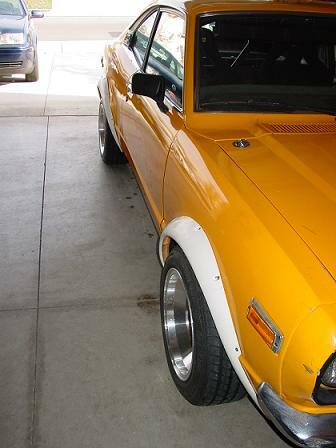 I want the wheel and tire to be right at or better inside the outer fender wells. Also, what size tires and width rims fit the best on these cars. +10 in the front and 0 offset in the rear is good... of course, backspacing is relevant in this. i'm basing it off on a 15x7 and 15x8 wheels. if you would go any wider or thinner in diamater, then offset would drastically change as well. 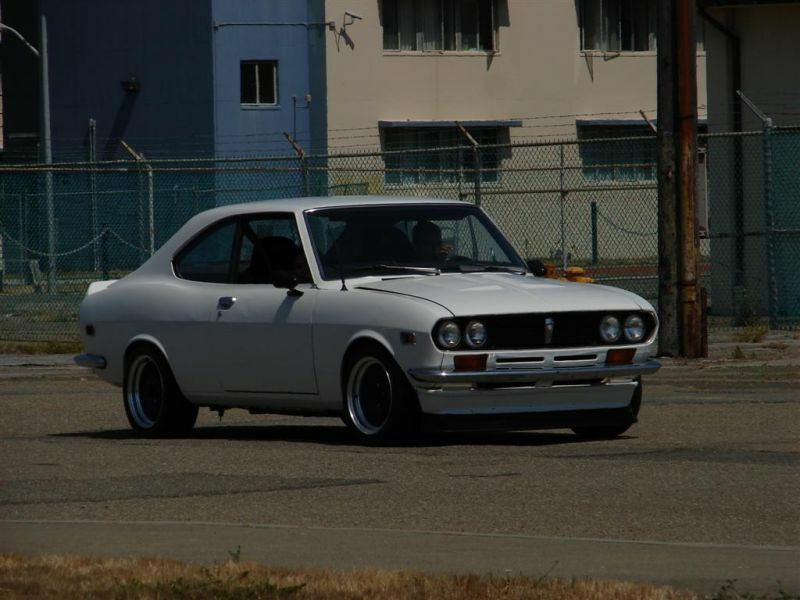 I cant remember the off-set on my bro's RX-2 but in my RX-3's, I was able to fit 15x10 and 15x9 with 4.75 backspace. 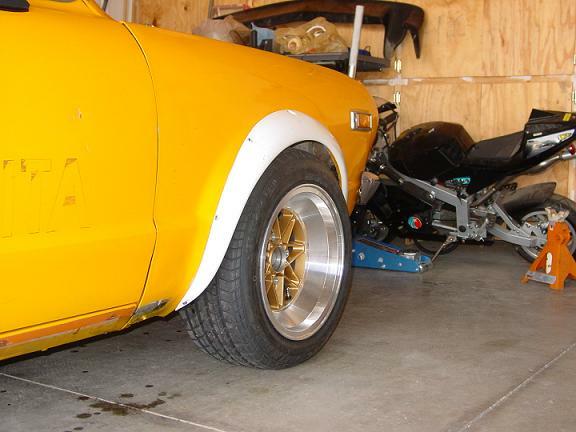 I have 15x7s with 7mm offset on my '2 right now, and they are fairly flush with the fenders. I think they look pretty good. Could possibly get away with a lower offset but I don't have anything lower besides 15x8 Eps with 0 offset, and those stick out way too far. 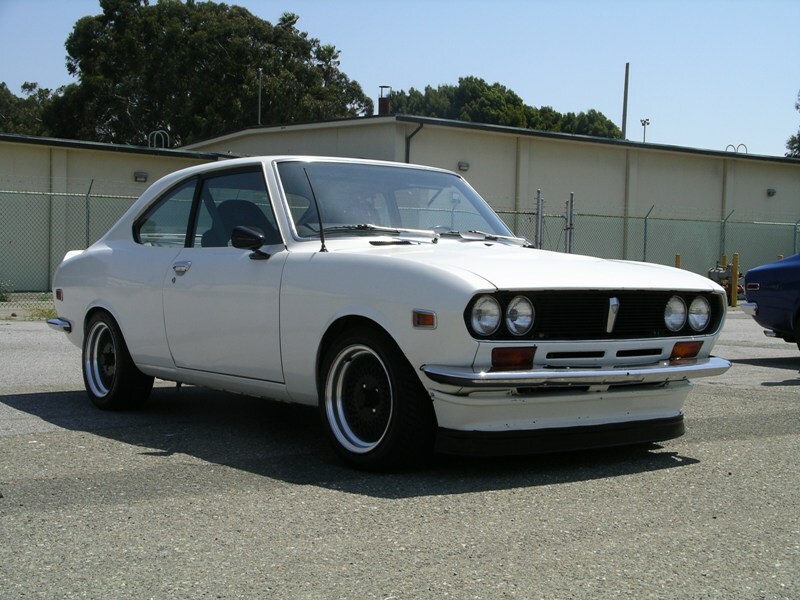 What about a '74 RX-4 wagon? The RS-8's on my car run a +9 on a 6.5 in front and +15 on a 7 in back. Fronts are about as wide as you really want to go without rubbing like a ****...but 7 has plenty of room in the rear...I'd say 1/2" on the inner fender and 1" to the outer. To fit an 8" is easy in the rear. Just gotta try 'em. I would say a 7.5" with a 0 offset or an 8" with a +5 or +10 would work about right. NOW JUST FIND THE RIMS WITH THE CORRECT PCD!! I'm lookin' at some Work 4-spoke equips...$$$$, but you can get 110. BTW...tires are currently 195/50/15 all around, but 205-215 will fit proper on the 7" in the rear without rubbing. Thanks for the info guys. Now I just have to find em. 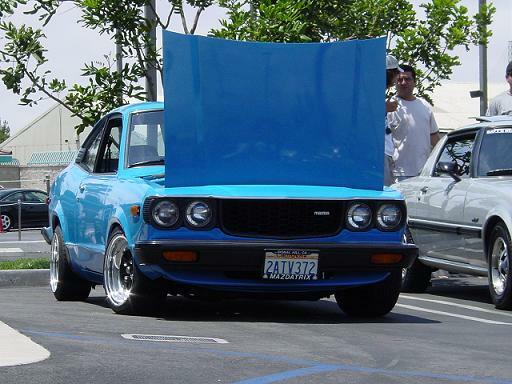 The blue 2 belongs to 73IMPORT. Maybe he can chime in on what offstet his wheels are. I found a set for my 2 but they are 7.5 with a +20. I wonder if I can get those to fit with a set of spacers? Hey Jesus....those should fit without spacers....+20 was our stock offset. yeah but stock wheel size was 5.5, which means about 3 inches of backspace. With a 7.5 inch rim, I am looking at 4 inches of backspace. Is there enough clearance in front for 4 inches of backspace? Ultimatejay, I hope this help you out ! Hey, Did this rx-2 come from Newport News, Virginia ? Does anyone know if a 15x7 with a +20mm wheel will fit my rx2? yup. it'll fit nicely, but nowhere near flush... i'm running 15x8 0 offset wheels all around and it was a tight fit but i made it happen. 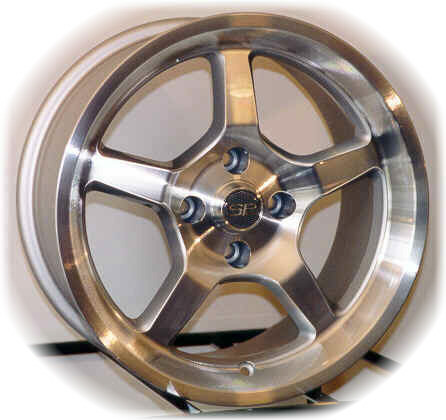 Have you found a wheel with a 4X110 bolt pattern yet?? 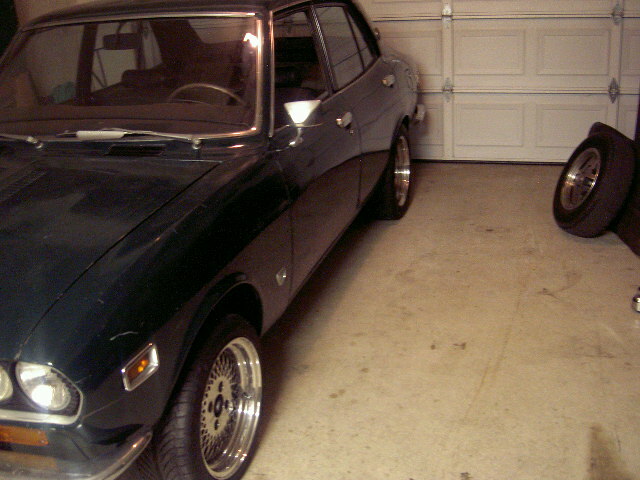 Thats the problem I had selecting wheels for my RX3. When I was chalanged with figuring out the correct offset I checked all the sites and found a large variation in what people were saying they have. I wondered about the 15 X10 wheels without tubs and figured they must be happy with a different "look" than I was going for. My best advise is that there is a lot of good information on how to measure offset on a wheel. Using the wheels you have now (I had 2 sets, original and some 13 X 6) measure, measure and measure! I had to concider both the location of the strut and the steering arm to make sure the wheel would fit. The 15 inch wheels reached beyound the steering arm to give me clearance so the strut was the only interference point! 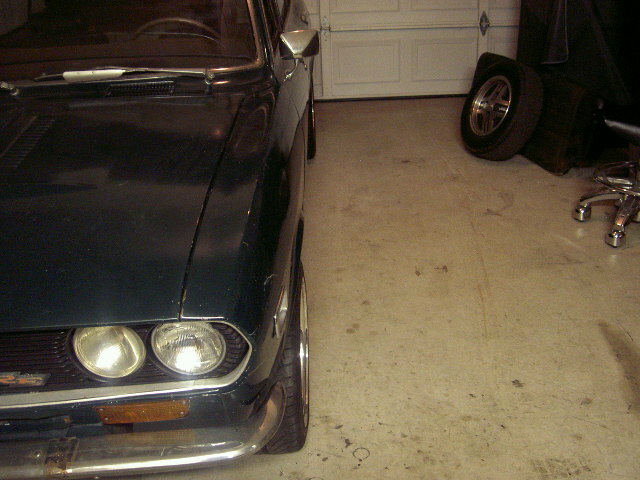 I determined that an offset around + 12 was best for clearence on the strut and the fenders. I could only find a +20 offset in a 15 X 7 with a 4 X 110 bolt pattern! This will be close to the strut, but gives me more room at the fender! They are made by ROH called "snyper". I've ordered the wheels, but have not got them yet. Maybe today!! The ROH's you have pictured will fit. I had a set of them on my duece. Right on. I found a set of brand new Konig rewinds 15x7 with a + 20mm offset. There are local, so I am going to drive my duece down to the shop and mount one up to see if the fit is ok. So what tire sizes fit the best with 15x7 all around? I belive 205/50/15 are recomended. I have heard of 215s being forced to fit but you have to go with a smaller overall diameter, I think it's about 3/8s smaller but I don't recall the aspect percentage. Wile we are on the subject, If you realy want to build a 350 HP car, a 205 width tire won't get the power to the ground. You will have a hard time getting the car to hook unless you go with a much wider tire. I believe godzilladefenseforce said he has 225 width rear tires on his and still feels like he is in ice in first and second gear. (he has a s5 turbo II engine like you want to set up yours) Check his website out, he mention it in the image gallery where posted pictures of the car with work equip wheels. Thanks Cuthbert. I just got some wheels today finally. 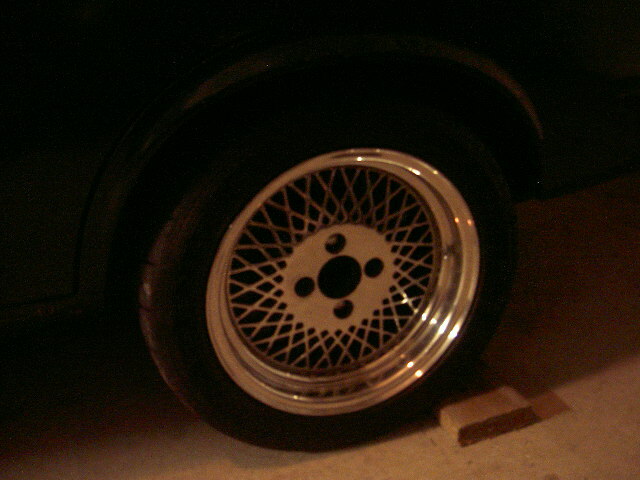 They are polished enki's 15x7.5 with a 7mm offset. The front tires are 195/45/15, which he said he had a very hard time finding, and the rears are 205/50/15. The offset looks really good on the car. I don't know about the smaller tires in the front because it makes the car look high in the front. What do you guys think? Cuthbert, regarding the size tires and hooking up- drag radials. Just can't drive in the rain, but it never rains here in Cali. hehe. Here are some pics of me new wheels. 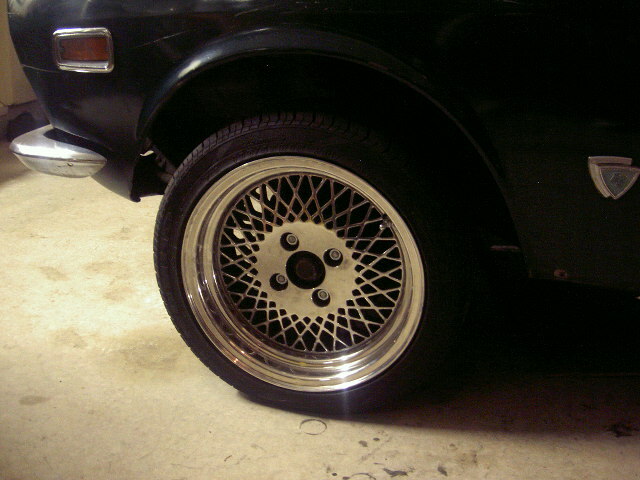 Exact same wheels I have on my '2 right now, although mine are 15x7s w/black centers. You sure yours are 7.5" wide? I didn't think they made a 7.5, but you never know. The owner told me they were 7.5, but after measuring they are 7. What size tires are you running? 195/50/15 are going to be your best bet. The 205's are going to rub.